Fourth of July is right round the corner and that means parties, BBQs, fireworks and great eats. Ensure a fun, fashionable Fourth with holiday inspired clothes for your little ones and recipes that are sure to impress. We have some adorable outfits for the kiddos this holiday and an amazing recipe that you won’t want to miss. Made for you by Sweet Threads, our PAUSH line has some new arrivals that are perfect for the Fourth. We ensure that every item in our line is on trend and fashionable, made with the most comfortable materials possible. Our pieces are the best blend of modern and vintage. We have three classic outfits to choose from for this Fourth of July. Wearing an outfit from PAUSH will make your little one will stand out this holiday. If this isn’t the perfect outfit for Fourth of July, we don’t know what is! With the classic stars and strips print, this romper will get your little one into the holiday spirit and feel comfortable for a long day of fun and good eats. This romper also includes a halter neck tie, elastic waist and crotch snaps. We like our rompers to be cute, comfortable and functional. This is the perfect outfit to kick start the summer! Everyone will ohh and ahh over your little one in this classic piece. Not to mention, the vintage blue color is sure to delight your kiddo. The romper features a detachable red bow tie that you can use to accessorize other outfits as well. It has halter neck ties, an elastic waist and crotch snaps. Just imagine your kiddo running around in this fun summer outfit for the Fourth of July. What screams summer fun more than polkadots?? This fun, classic polkadot print brings smiles to those who wear it and the mothers around it! Put a little pep in your kiddo’s step and get them this perfect summer piece for the holiday. It features a detachable red bow tie, allowing you to wear the romper with or without the bow tie. Our romper also comes with the classic halter neck ties, elastic waist and crotch snaps. Enjoy your little one in this summer lovin’ outfit for the Fourth of July. Having the perfect summer outfit is a must when attending a Fourth of July party! And these rompers are sure to be the talk of the neighborhood when your little one shows up in one. Order your favorite at shopsweetthreads.com or come in and see us at our Long Beach location. We love to style entire outfits for fun occasions, just like the Fourth of July! You’ll receive the star treatment when you come into our store. We hope to see you there! Finally, we did not forget about our favorite recipe for the holiday this year. 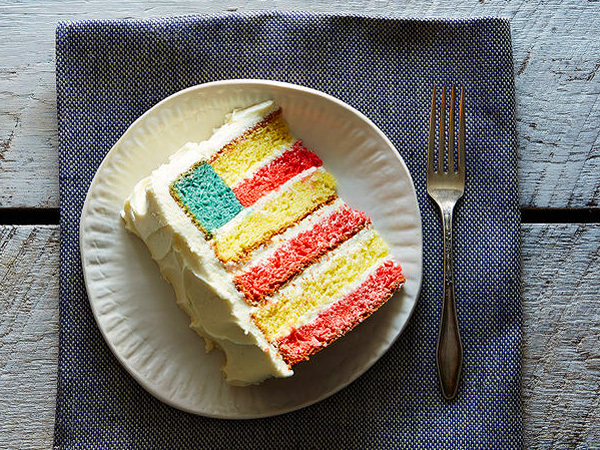 You’ll impress everyone at the block party with this Fourth of July layer cake. It’s not only gorgeous, it’s delicious and fun to make! Bake 5 9-inch cakes – 2 red, 2 white and one blue. Use 25 drops of red food coloring for the red cakes and 20 drops of the blue food coloring for the blue cake. Let the cakes cool completely before assembling. While the cakes are cooling, make your frosting. In the bowl of an electric mixer fitted with the paddle attachment, cream the butter and sugar until they’re light and fluffy, about 5 to 6 minutes. Beat in the vanilla, then add the cream gradually, mixing until you get a smooth, creamy texture. Then, use the same technique to cut a hole in the center of the blue cake. You won’t need the inner blue circle, so set it aside. To build the cake, start with a red layer and top it with a thin coating of frosting. The key is to make it thin, otherwise you will interrupt the “stripe” effect. Top the red layer with a layer of white cake and another thin coating of frosting. Now you’re golden. Frost the cake with creamy frosting using a small offset spatula — be sure to make it swirly. And you’re done! 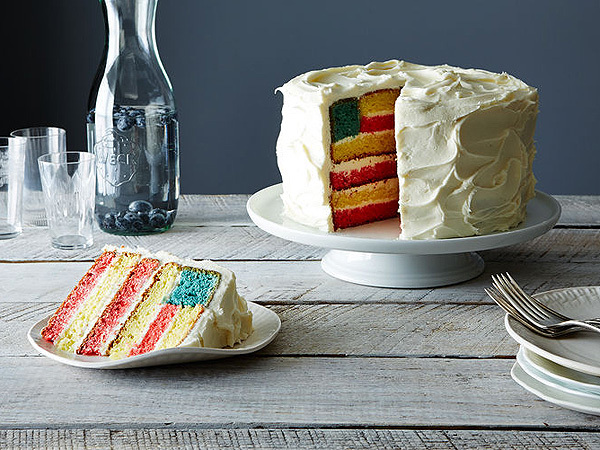 You’ll have a beautiful cake to present to your guests on the Fourth that will wow and impress. We hope that these outfits and recipe will make your Fourth fun and fashionable. Happy Fourth of July! !